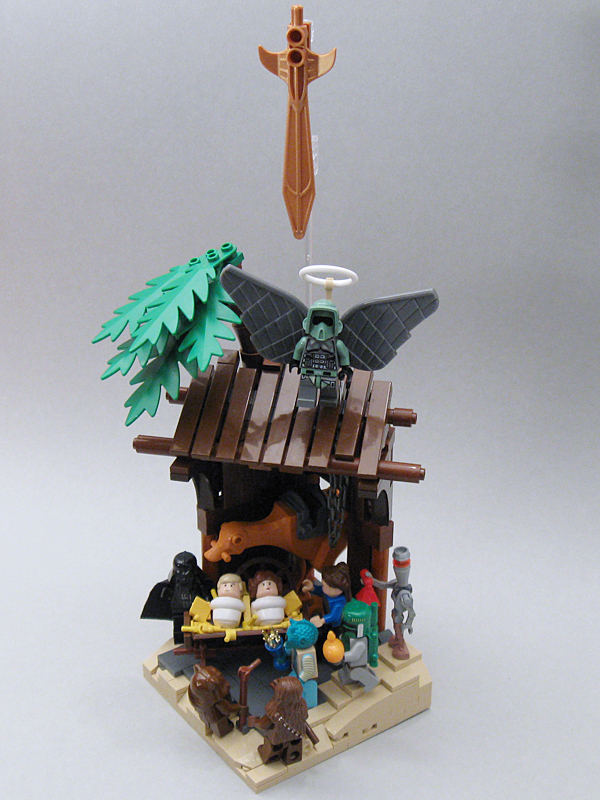 Flickr user Larry Lars presents the nativity scene with a twist, adding Star Wars characters to the mix. Hilarity ensued. I always believed IG-88 to be a wise man! I mean bot! I’m not usually a huge fan of vigs, and despite my username I’m not always ga-ga over Star Wars MOCs, but this thing is just awesome. I may have to replicate this and put it next to my tree this year or something. Oh come now, Greedo shot first! A wise man he is not! Leia was born with hair buns… now I know. come on! shouldn’t the wise men followed a death star? And, of course, Jar Jar is one of the animals in the stable.. I agree, this is amazing, but it should have been a mini death-star! I would love to see a detailed shot of how he built the building. Uh…did you know you have 2 babys in there? There’s supposed to be one. It’s really fun to see all the reactions to this vig. I’m glad that so many seems to like it. Matt: Since it was built for a contest with a size limit the walls had to be really thin. A lot of tiles are standing up conected to clips in the floor. The roof is made of headlight bricks on the side to get the distance between the tiles. I’m going to upload som pics of the construction details eventually. @EJ – yes, I know, I innocently replaced my VHS copies with DVDs only to discover I’ve now got the version George Lucas tampered with. It saddens me to think there are kids out there who really do think Greedo shot first. I did mention it in an episode of my comic (not at all a plug…) a few weeks back. Anyway, back on topic – in my indignation (!) earlier I forgot to say how totally cool and clever this MOC is. I’d display in my front window! what’s with the huge sword?